Ishida Weinberger 2 (IW2, PK 108+08) is a large, ancient, ellipsoidal planetary nebula (PNe) in the constellation of Cepheus, and is about 850 light years distant (Ishida and Weinberger, Astron. Astrophys. 178, 227�236, 1987). It appears to be slightly elongated in the NW-SE direction encompassing about 18.5� (north is toward the upper right). The field is 32� x 32�. From the expansion velocities of H-a and NII, IW 2 is estimated to have a kinematic age of about 40,000 years. It is quite faint but emits both H-a and NII, but no detectable OIII with our equipment. The effective temperature of its white dwarf star is 100,000 K. It is one of the largest PNe known, nearly 4 light years in extent. The filamentary structures are likely to be shock fronts due to the PNe interacting with the interstellar medium (Xilouris et al. Astron. Astrophys. 310, 603�612, 1996). 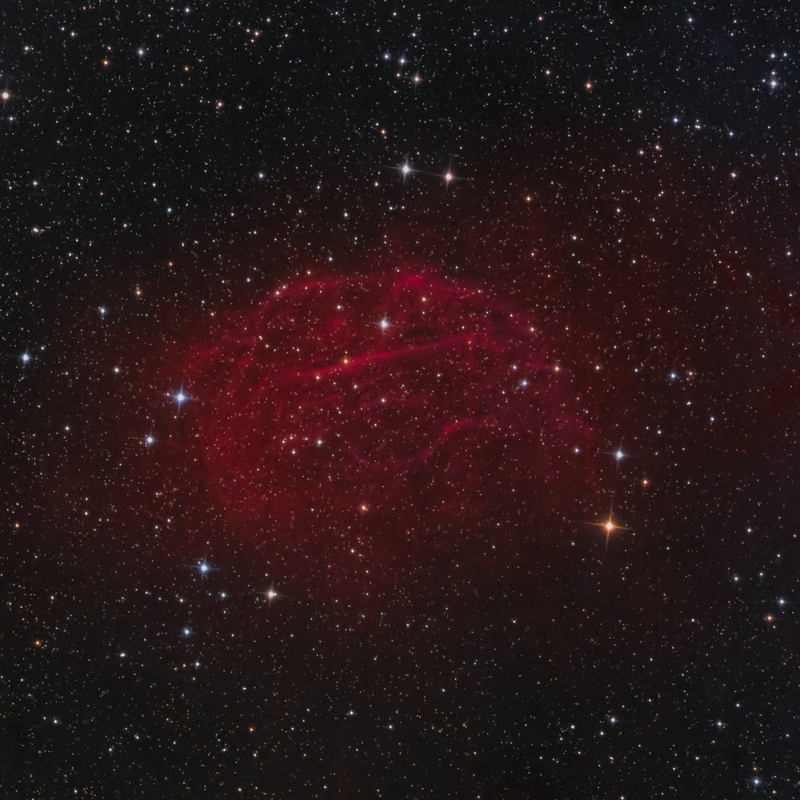 This image includes 6.5 hours of 3 nm H-a and 5.5 hours of 3 nm NII data, with 1.25 hours of RGB data for star color. The H-a data were mapped to red and the NII data to magenta to keep the overall appearance as �natural�. This may be the only color image of IW2!